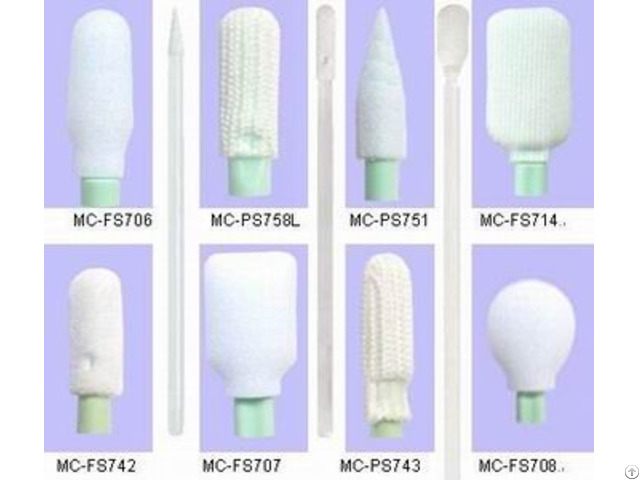 Microcosm controller is one of few companies in China can make ESD safe swabs with Transparent Polypropylene Handle, our production technology with the static dissipation, cleanliness and ions control of this swabs have truly came up to advanced world standards, welcome to test and order. Long handle and short handle, sponge head and fabric head, rectangular head and circular head, rigid paddle head and flexible tip etc., design for cleaning hard reached holes and groove of objectives, Various kind and Sizes to meet Different Application Need, laundered and packed in ISO Class 4 cleanroom, Low in both Particles and Extractables, No detectable silicon oil, amide and DOP, Latest thermoplastic technology, head is hard to separate from the handle. stranger removal ability. Soft head with antistatic pp handle. Antistatic Cleanroom Foam Swab is constructed from compressed 100 ppi (Z) open-cell polyurethane foam or 100 ppi (Z) closed-cell polyurethane foam and 100% virgin polypropylene handles.